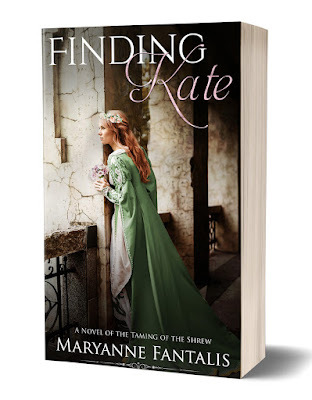 City Owl Press: Happy Book Birthday to FINDING KATE! Happy Book Birthday to FINDING KATE! A delightful re-imagining of “The Taming of the Shrew,” sure to enchant longtime Shakespeare fans and newcomers alike. Kathryn’s strong will and sharp tongue have branded her a shrew in her small town. Now, not even the generous dowry offered by her wealthy father can tempt any man to court her. But when Sir William rides into town on his magnificent war horse, Kathryn’s world turns upside down. William is like a burr in Kathryn’s side from the very beginning. Even the way he insists on calling her “Kate” irritates her thoroughly, yet she can’t keep from listening for his voice. Though he claims he is the only man for her, she is certain he only wants her rich dowry. When he proposes marriage, she accepts as a way out of her miserable home. Freed from her cruel family and judgmental town, Kathryn must decide whether she will continue her battle of wills with the sometimes charming, often maddening Sir William. Will she remain the shrewish Kathryn or find a way to be Will’s Kate?